While the Wicked Witch holds Dorothy in captivity, she often threatens to beat the small girl with her umbrella. Dorothy does not know the witch is too afraid to actually strike her, and cowers before the wicked woman. From Greg Hildebrandt's 1985 Illustrated Classic, "The Wizard of OZ." 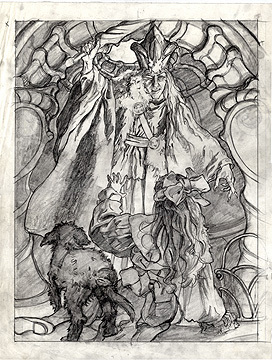 This is the drawing Greg used to transfer from for the finished pencil illustration that appeared in the book.